Ken has worked as Master Electrician for the Shaw Festival, Niagara on the Lake and at CFTO (CTV) in Toronto. He toured Canada, the USA and the Caribbean for 10 years with corporate shows, as Lighting Designer and Technical Director; clients included American Express, Labatt Beer and Tupperware. Ken has worked extensively on documentaries for CBC and the National Film Board of Canada, shooting in Canada, the United States and Central America. He has also worked as Gaffer and Lighting Director on feature films, network series productions and too many commercials to count. Credits include: The Gate, Prom Night II, Blue City Slammers, Test Pattern, The Toronto Arts Awards, Video and Arcade Top Ten,The Shirley Show, Eric’s World, Game Nation, Regis and Kathy Lee Live from Niagara Falls, Canadian Association of Broadcasting Awards, Rufus the Dog, Amigo and Me and Big Comfy Couch. Ken served as House Lighting Director for VTR Productions in Toronto from 1986 to 1991, and at YTV Canada from 1990 to 1993. Ken worked on various shows with Henson Productions and The Muppets for eight years. With Lighting Designer John Rook, he was Lighting Director for The Jim Henson Hour, nominated for two Emmy Awards. Other credits include The Miss Piggy Special and The Muppets on Tour. With the CBC, among a multitude of projects, he lit for Comics, Kids in the Hall, National Program Promos, Olympic Promos and Canada – A People's History. 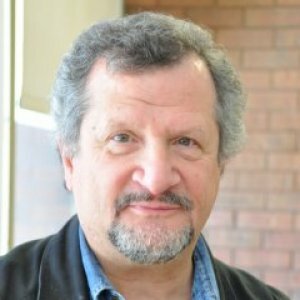 He is currently the Department Coordinator and Professor of Theatre Arts-Technical Production Program at Cambrian College in Sudbury, Ontario. Before coming to Cambrian, he taught Lighting Technology and Lighting Design for Live Theatre at Humber College in Toronto, as well as Lighting Seminars and Workshops for Film and Video lighting at York University, Centennial College and Niagara College. Awarded by Science North, in recognition of outstanding contributions that make northern Ontario's top science education and entertainment destination a greater place to be. This award recognizes contributions made through an agreement with Dynamic Earth and its Hallowe'en Tunnel of Terror, which is a spooky experience for visitors added annually to the amazing underground attraction. Ken Salah is lighting designer for the Sudbury Theatre Centre production of Red. The show is a co-production with Cambrian College. “Ken Salah and his theatre technicians have created a fabulous set,” Tedford said. 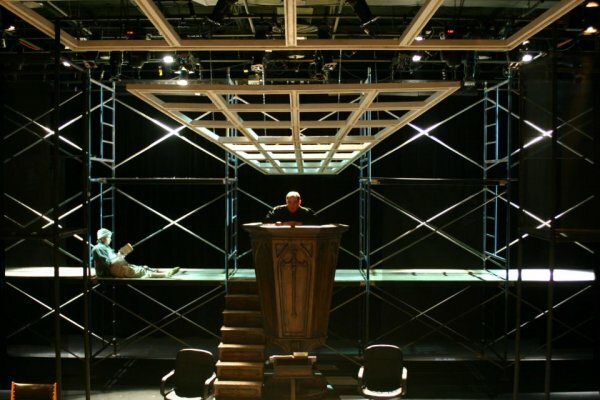 Ken Salah and some of his students design and build complex sets for local theatre productions. Judas Iscariot's case is about to go before the courts again — and the audiences. This March, Thorneloe University Theatre Arts is presenting the story, which tells the ultimate fate of Iscariot. “The plays uses flashbacks to an imagined childhood, and laywers who call for the testimonies of such witnesses as Mother Teresa, Caiaphas, Saint Monica, Sigmund Freud and Satan,” a media release stated. The production stars Thorneloe theatre students, as well as local actors. Patricia Tedford, chair of the Thorneloe Theatre Arts department, directs the production. Ken Salah provides the lighting design and Robert Ivey designed the set. Tickets are $15 for adults and $10 for students and seniors. They are available in advance from the Thorneloe University main office, Black Cat, the Laurentian University and Cambrian College bookstores or online at thorneloetheatre.eventbrite.com. The production is on stage March 1-2 and 7-9 at 7:30 p.m.
On March 3, a 2 p.m. matinee is scheduled. All shows take place at the Ernie Checkeris Theatre at Thorneloe. The co-ordinator of Cambrian College's theatre arts technical production program was recently honoured by Thorneloe University. Ken Salah was awarded Thorneloe’s Honorary Fellowship Oct. 9 in recognition of his important contributions to theatre production in the Sudbury community and at Thorneloe. Thorneloe “produces edgy and exciting theatre that fosters and promotes professional opportunities for local theatre artists and behind-the-scenes production people, including students in Cambrian College’s theatre program,” a press release from Cambrian said. “Our faculty members combine years of experience in the field, with a desire to teach the next generation of employees and entrepreneurs,” said Cambrian College vice-president, academic Sonia Del Missier, in a press release. Dynamic Earth is supercharging its Tunnel of Terror this year, thanks to a partnership forged in the deepest, darkest recesses of the underground haunted mine. This year, Dynamic Earth has enlisted the aid of Cambrian College's Theatre Arts - Technical Production program to amp up the fear factor of the Tunnel of Terror. Julie Moskalyk, Senior Manager of Dynamic Earth said she's so confident in the Tunnel Terror's scare factor, they aren't allowing anyone under the age of six to enter. The Tunnel of Terror at Dynamic Earth is full of ghastly ghouls this year, and the fear factor has been jacked up thanks to a partnership with Cambrian College's Theatre Arts - Technical Production program. To further entice those with a fetish for the frightening, Dynamic Earth and the Northern Ontario Railroad Museum and Heritage Centre in Capreol are offering Tunnel of Terror and Terror Train combo packages in an effort to provide the best heart-stopping value for thrill-seekers. Survivors of the Tunnel of Terror will also be able to climb aboard the Terror Train, and to get there, they can hitch a ride on the Terror Coach Shuttle, a mode of transportation that is not for the faint of heart. The Tunnel of Terror is not for young children, said Moskalyk. Those under 12 years of age, and individuals still working up the nerve to descend into the bowels of the Tunnel of Terror, will prefer the family friendly Halloween activities located above-ground at Dynamic Earth. Visitors are encouraged to come in costume and discover live Halloween-themed science shows and workshops, animals and insects, crafts and games, and so much more. A Halloween film festival will also be included with admission to Dynamic Earth.